The cultishly adored Watch Repair figures bless ONO with a 5th ether dream sequence of haptic rustle and chimes following lots of love from notables such as Jon K and Tom Boogizm for their earlier instalments, including the now sought-after Stopped Clock Chimes. Again, with The Polarities the listener is strung out in a cat’s cradle of gently reverberant dulcimer, reed organ, guitar, thumbtack gourd and other, assorted inputs, to conjure something like an ephemeral, wind-powered sound sculpture or tone poem collage akin to Smegma jamming with Andrew Liles, or Anne Guthrie smashed on valdos with Kemialliset Ystävät. There appears to be four guest personnel on board this time, in addition to the unknown quantity of Watch Repair (if they even exist, and aren’t actually mechanical figments of Michael Holland’s imagination), with at least eight hands on deck lending this session a nimble, if subtle sense of movement within its viscous, puce hued stasis. The seamless session achieves a most desirable effect, floating weightless between what sound like subaquatic jazz refrains to seamlessly segue afternoon matinee soundtrack themes with coastal field recordings and passages of glistening, plasmic chimes that unfurl and wave like the fronds of deep sea flora caught in the current. If you’ve loved the others we’re certain you’ll be smitten with this one, too. You’re encouraged to try playing it whilst staggered with the soundcloud file for optimal disorientation. Recommended! Read up on this release on John Coulthart's Blog , he graciously designed the packaging... for this and also the Watch Repair releases. 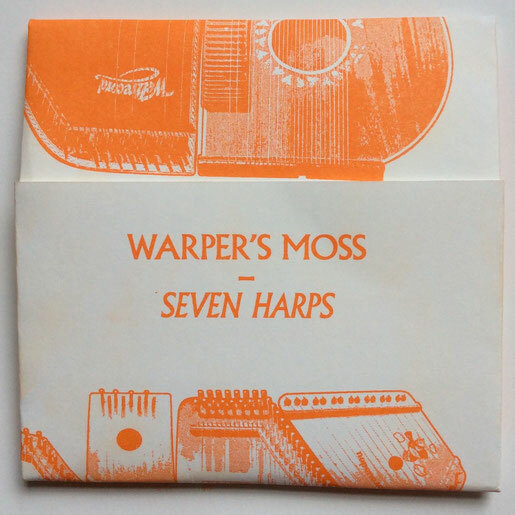 Beautiful new ONO release from a Watch Repair Collaborator who would like to be known as Warper's Moss . Dan's first release on ONO with music made with love for his large collection of harps. Many beautiful moments to be had from tracks such as the playful "Toyshop" which lightens up any day! The cd as a whole is a beautiful thing and it sounds like a clearer less layered watch repair release but has been produced entirely by Dan B who plays on many of the watch repair hits such as at the bay , sea shanty township and further to the west. 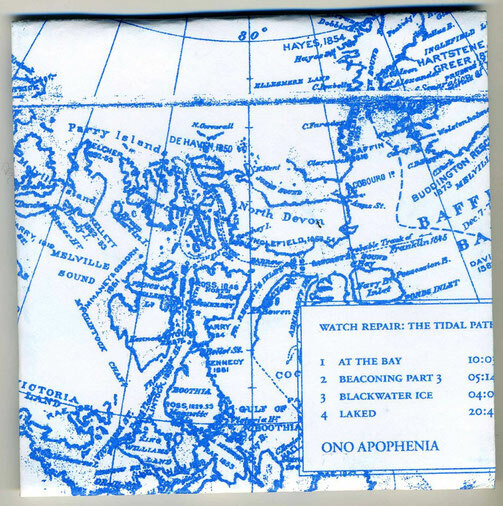 This is the fourth Watch Repair CD on Ono and i'm proud to say i think its the best ever !!! Love to see how their sound develops over time with a clear sound emerging from the seabed. 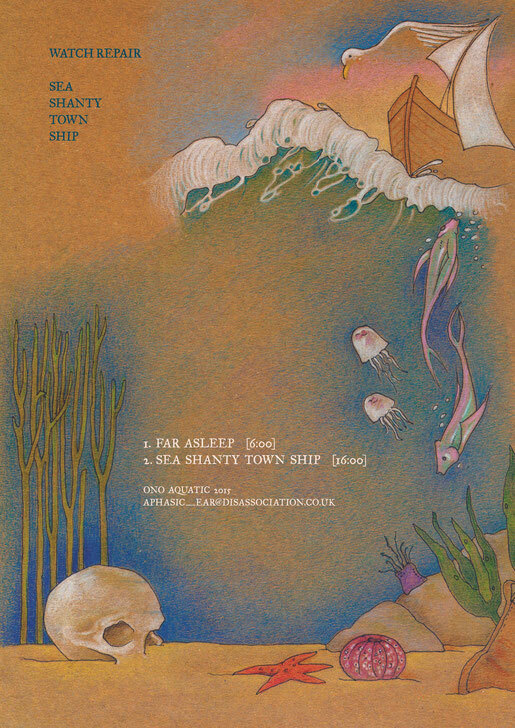 Two tracks of sleepy sounds Far Asleep taking the original "Stopped Clock Chimes" and expanding on their texture in a less structured but more intuitive way. In my opinion its beautiful. Sea Shanty Township is the more developed and expanded lineup of Watch Repair musicians working together. 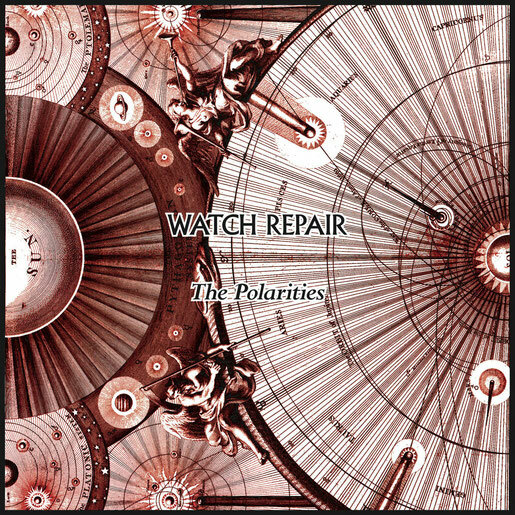 A watch Repair supergroup is starting to emerge this is my absolute favourite watch repair release so far just because i'm enjoying so much seeing them develop and grow so perfectly as a team! 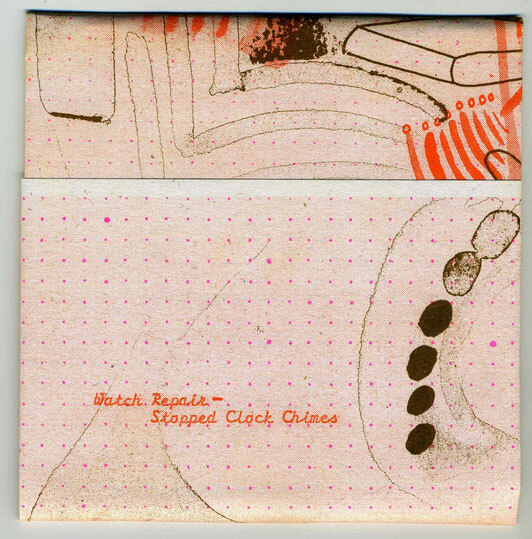 Watch Repair return to ONO with a lovely 3rd issue of lower case chimes, strums and rustles burnt to 3" CDr housed in wrap-around artwork. They're like waking dreams in sound, rending the haptic friction of skin on strings into gently dabbed blue notes and shimmering, plangent harmonics. You might well find yourself holding your breath so as not to disturb the deliquescent fragility of 'Far Asleep', and, likewise, lovers of the quietest wheeze and crackle from Cotton Goods or Flau Recordings will be rapt with the 16 minutes of marginally more dynamic strokes and caresses in 'Sea Shanty Town Ship'. Watch Repair : The Tidal Path is the third album from this mysterious sound sculptor known only as Watch Repair. A development of previous experiments this is my favourite yet and its sound is complex and more subtle than the previous releases it includes my favourite track by them so far 'At The Bay'. A much more complex listening experience with many new sounds in the mix that literally take you on a journey following the tidal path. I'm very proud to be able to add this beautiful release to my Ono catalogue and i think it could be my favourite release yet , since listening to it many times over the past year , in various forms of development i'm proud to release it into the world on sunday 8th of march 2015. This is one for fans of sleepy music like Tenniscoats and other minimal creaky accidental sound. A precious document of the new sounds emanating from the Watch Repair studios known now as Tinywytch Studios. For me, a very exciting development indeed. 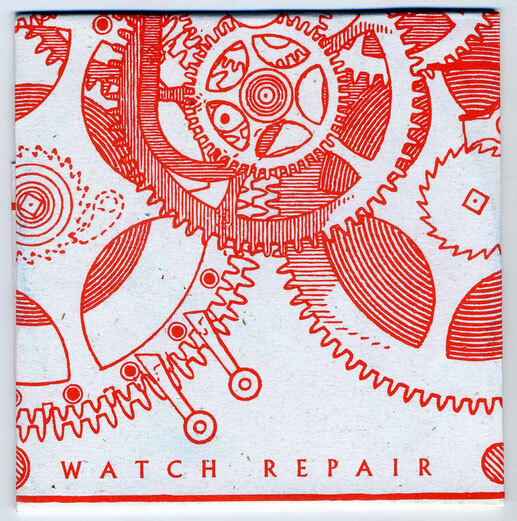 Brand new special edition CD-r release from shop favourites Watch Repair on Manchester’s seminal DIY label - Ono. Towards the end of last year label owner Michael Holland brought in their debut for the label entitled "Stopped Clock Chimes"; a beautifully organic piece of music comprised solely of 'field' (more like 'home') recordings of various grandfather clocks, clock chimes and other found sounds from the world horology ('the art of measured time' fact finders). The formula hasn't changed (thankfully) so you'll be glad of another 37 of minutes of sombre, minimalist, serene enchantment. Occasional moments of serendipity where melodious chimes and bells meet in key, or moments of unplanned discord, as resonant frequencies collide with standing waves. The warm, untreated recording aesthetic places the listener right in the space, sounding like you're lost in a dream in your grandparent’s old house, and you can almost smell the atmosphere, never mind hear it. In a world full of bland field recordings, ambience with no purpose and soulless black noise, this is a refreshingly meaningful piece of 'found sound' muzik, and comes highly recommended from shop daydreamer Matt. The words to accompany the first few copies of this release written by my friend Dr Winkle. Matt ward at piccadilly records said: Excellent, atmospheric weirdness from Michael Holland's Ono label. Comprised entirely of sampled clock chimes, the level of intimacy, melancholy and introvert beauty contained within such a simple structure; is actually quite overwhelming.